It's fair to say that the VR revolution is now in full swing. But while Oculus, Microsoft and Sony didn't really have anything especially noteworthy to show off in Cologne at Gamescom 2015, HTC continued to blow minds with its latest Vive demos. Wareable has had all the big name VR headsets strapped on its collective bonce over the last few months and it's fair to say that HTC's Valve-powered effort is creating the loudest "wow" moments. No more so than the Secret Shop experience, based on Valve's Dota 2, that got its world premiere at the giant German gaming expo. 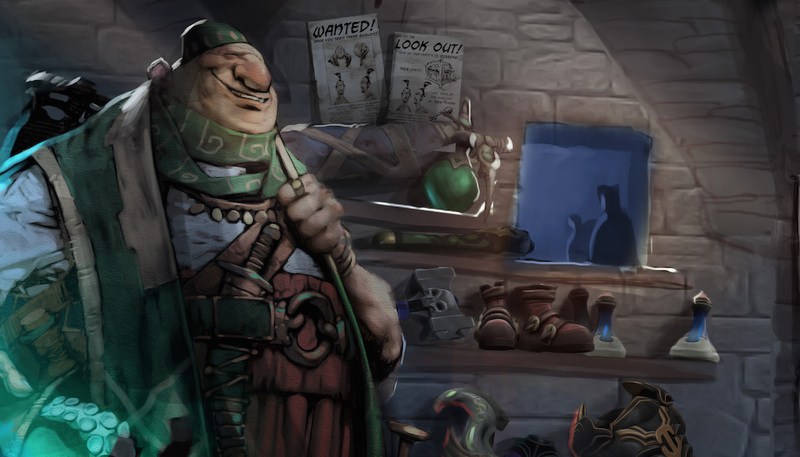 The Secret Shop demo drops you into a magical store, packed with potions, dragons, weapons and more, and you're instantly greeted by a friendly shopkeeper, who gives you a light to help you look around. And look around is exactly what you want to do – like all good VR experiences, the 360 visuals are stunning and you really do feel as if you've been dropped into another world. You use the light to interact with objects and gain new perspectives. For example, on a table there is a number of maps and old letters; if you hit the trigger on the controller over these letters you are shrunk down so as you are walking on them. You can do the same on the shelves in the shop and on various tables. The impact is immediate and stunning, you feel small and your surroundings become intimidating. During the 10 or so minutes we were in the Secret Shop, we experienced a friendly dragon, who we ducked down to play with and get a closer look; a grumpy toad who didn't like us sharing his shelf space, an angry goblin who jumped through a drain and scared the life out of us; and a jack in a box who gave us flash backs to a weird German bar we'd frequented the night before. The demo ended when the ceiling caved in as the shop was attacked by a huge monster. An everyday occurrence in the Dota world. Those last couple of paragraphs give you a small, if somewhat underwhelming, overview of HTC's latest, and greatest, Vive VR experience. In order to truly understand the impact of a genuinely game-changing medium, you'll need to get a Vive on your head yourself. With a 2015 consumer release planned, you might not have long to wait for long. In the meantime, you'll just have to take our word for it that HTC is a serious player in this emerging market. While Oculus is the darling of the VR industry, and has Facebook's huge bag of cash behind it; and Sony has an immediate audience for its Project Morpheus headset with PlayStation 4 gamers, HTC has the power of Valve behind it – and that's not to be underestimated. Dota 2 is a huge esports success story, with over 20 million registered players. Its annual championship tournament, The International, features 16 of teams battling for a humongous $18 million prize pot. Valve also Valve developed the critically acclaimed Half-Life, Counter-Strike, Portal and Left 4 Dead and is, of course, the driver of Steam – its PC-gaming platform with over 4,500 games and 125 million active users. Samsung may have been the first smartphone giant to unleash a VR headset, and has Oculus in its corner for the Gear VR but its HTC and Valve making the biggest waves.